Grant McCann blows a kiss to the Posh fans after the win at Shrewsbury. Photo: Joe Dent/theposh.com. Caretaker-manager Grant McCann was full of praise for his players after a thrilling 4-3 win in League One at Shrewsbury today (April 30). 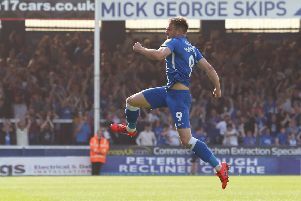 McCann insisted his players showed great character to claim a winning goal four minutes into added time after surrendering a 3-0 lead in a mad finish at the New Meadow. Posh striker Shaquile Coulthirst is closed down by the Shrewsbury defence. Photo: Joe Dent/theposh.com. Goals from Jack Baldwin - his first for the club - and Lee Angol (2) appeared to give Posh an unassailable lead with 20 minutes to go, but the home side levelled in the final minute of normal time after scoring three goals in just 16 minutes. But up popped Jon Taylor, a former Shrewsbury star, to claim a dramatic winning goal. “I was far happier at 3-0 than I was at 3-3,” McCann stated. “But I sensed deep down that we would score again and Jon has delivered a quality finish to win the game for us. “The lads showed great character to hit back after losing a three-goal lead. I’ve kept them fresh in training this week just so we would still be running hard at the end of a game. Posh full-back Harry Toffolo is on the attack at Shrewsbury: Photo: Joe Dent/theposh.com. “We were a bit complacent at 3-0 up and we’ll talk about the defending next week. The win was all that mattered today and to come out on top in a game like this is great. “I said to the lads after the game that this is what playing for Peterborough United is like, and Gaby Zakuani burst out laughing. We will play attacking football and we will concede goals, too many at times, but it will always be exciting. “I was pleased with a lot of our play. Adil Nabi was very good. He is a clever footballer and I like clever footballers. He showed that with his assist for Lee’s second goal. “It was great for Lee to get back on the scoresheet as well, while Shaquile Coulthirst also did well. “I asked the lads to be brave today. We wanted to dominate the ball, but if we didn’t get it back within six seconds I didn’t want anyone to panic. I told them to just get back into shape and stay patient. The win improved McCann’s record as a caretaker-manager to two wins and a draw from three games. He was in charge for two games following the dismissal of Dave Robertson in September. But The 36 year-old would not be drawn on whether or not he will apply for the job on a permanent basis at the end of the season. McCann added; “Graham Westley has only just left the club so it would be wrong of me to discuss the manager’s job. “This week my concentration was fully on this game and next week my focus will entirely be on the Blackpool game. We want to finish with a win. McCann recalled on-loan left-back Harry Toffolo as one of five changes to the Posh starting line-up. McCann explained he wanted the POsh full-backs to play high up the pitch and Toffolo was best suited to that role. Posh moved up a place to 13th. They can’t finish any higher. They host relegation-threatened Blackpool in their final League One match at the ABAX Stadium on Sunday. May 8 (12.30pm).